Nothing was set so high by Nature that it could not be reached by Virtue. To the noble and eminent young, heir of the name and virtue of his great father, living hope of every good people, to FERENC PÁPAI PÁRIZ, my sweet relative, when setting out to visit foreign countries in the interest of common good, I recommend myself with this trifle, and urge him to seek what is hidden and dreadful. Péter Nádudvari, first minister of the Reformed Church of Szászváros, and dean of the honoured chapter of the same town. And I also apply to God to bless his peregrination with the wished good success. Péter (P.) Nádudvari was born around 1670. He studied from 1678 in Debrecen, and from 1692 in Nagyenyed (Aiud). He was a tutor of the sons of Sámuel Bethlen (?-1708). With the support of his patron he went in 1696 to the university of Franeker, and after his return he became his court minister. He was second minister from 1700 in Marosvásárhely (Târgu Mureş), and from 1705 in Szászváros; in 1706 he became first minister and dean in the same town. It was due to his courageous bearing that the Reformed community could keep their church and school in 1721. He was an ecellent preacher and orator. Died in Szászváros in 1726. He was the son-in-law of Ferenc Pápai Páriz Sen. (1649-1716), to whom he wrote both a laudatory poem in 1710 and a funeral one in 1717. His speeches were collected and published by Zsigmond Szathmári Pap on the costs of the writress Kata Bethlen (1700-1759), daughter of Sámuel Bethlen, patron of Nádudvari. His most important works are: Disputatio theologica de peccati natura, propagatione, atque speciebus, quam … sub praesidio … Stephani Enyedi … publice ventilandam proponit. Kolozsvár, 1695. – Idvesség uttya az az a hit ágazati körül való dolgoknak tárháza predikátziókban. Kolozsvár, 1741. – Néhai … N. P. uramnak … nyoltzvan-négy predikatzioi, mellyekben az igaz keresztyén vallásnak szent iráson épült fundamentomos ágazati … ki-beszélltetnek, és a mellyeket méltgs gróf Bethleni Kata … akaratjára, és kegyes költségével, … néhol egész prédikátziókkal is ki-toldozván, világ eleibe botsátott Szathmári Pap Sigmond. Kolozsvár, 1741. Péter Nádudvari wrote his memento on September 24, 1710, in Szászváros into the Album of his beloved brother-in-law Ferenc Pápai Páriz Jr., when this latter was going to set out abroad. The reading of the year is somewhat uncertain. 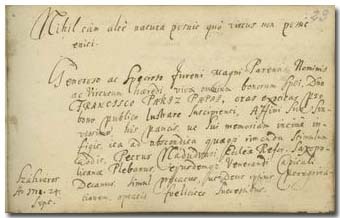 It cannot be 1711, because around September 20 Ferenc Pápai Páriz was already in Vienna, as it is attested by the notes of Count Bethlen, Prince Apafi and Mihály Balku (p. 9, 35, 19), as well as by a letter sent by Pápai Páriz to Count Sándor Teleki on September 20, 1711 [Peregrinus]. It seems therefore, that the travel mentioned here by Nádudvari was postponed by a year, either because of lacking financial support, or the Independence War of Hungary, which was just over by the summer of 1711.